Walgreens Shoppers! 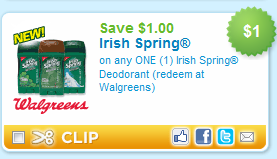 Print This for Free Irish Spring Deodorant Next Week! March 3, 2011 · by Zack & Katie · Post may contain affiliate links. See my disclosure policy here. Print 2 of these and use with the sale $2/6 with $4 in Register Rewards to make them free!